The previous Sunday it was 10 shots and everyone's over the moon, this Saturday it's 16 shots and the amount of negativity coming out is quite surprising. Obviously the big difference between the Arsenal and Sunderland games is the number of goals scored and ultimately the fact that we lost. The performance however wasn't too bad and you're going to get days where things don't come off. We lost to two extremely well taken goals and to a side who under the influence of Martin O'Neill are one of the form teams in the division. 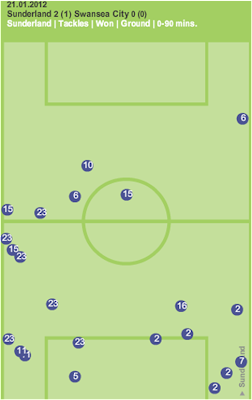 Despite Swansea dominating possession, the key for me was Sunderland's defending down the wings, with Sunderland making 22 successful tackles in total, with a particular focus on engaging higher up the pitch on their left (Swansea's right) where Dyer and Rangel have been so successful this season. 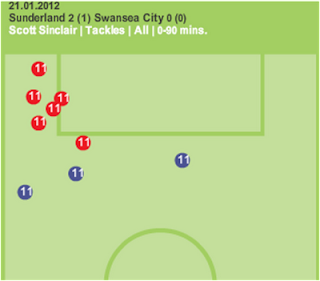 ﻿﻿﻿﻿It was a disappointing game in particular for Scott Sinclair, which is a long way from saying he had a bad game. He was well marshalled and of his 9 attempted 'Take on's' only 3 of them were successful. One of these was his lovely drop of the shoulder to go past the Sunderland defender only to try and smash the living daylights out of the ball. The 6 attempted 'Take on's' that didn't work were all in roughly the same area around the edge of the Sunderland box suggesting that the Sunderland defence had the measure of him in this game although often this was achieved by doubling up. Sinclair might not have had the greatest of games on Saturday but he has by far the most shots in the Premier League of anyone in the team with 65, the next highest is Danny Graham with 40 and it doesn't take a huge leap of faith to imagine a scenario where Sinclair would already be in double figures by now. 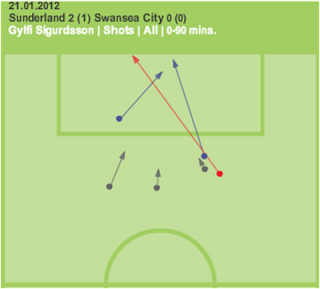 On a more positive note, Gylfi Sigurdsson looks a quality player and should chip in with a fair few goals between now and the end of the season. Dyer's recent purple patch excluded, the career goal scoring records of Dyer, Allen, Routledge, Gower, Britton etc., mean that there was increased pressure on Graham and Sinclair which now may be lifted with the arrival of someone who is not afraid to shoot. 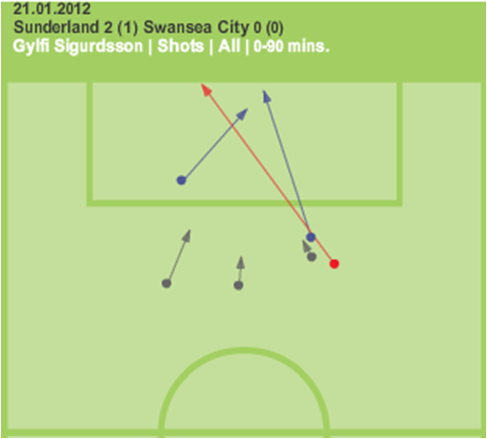 Sigurdsson had 6 shots against Sunderland, double that of any other Swansea player, and also made 7 of the 19 crosses (excluding corners) made by Swansea , suggesting he'll add a (relatively) more direct approach as well fitting in well with Swansea's style of play.